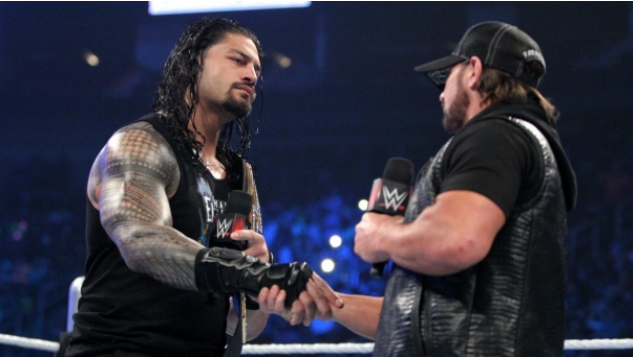 With AJ Styles being the first challenger to Roman Reigns' WWE World Heavyweight Championship, does he really have what it takes to succeed in the main event picture of WWE? On the morning of January 4th this year, four wrestlers from New Japan Pro Wrestling handed in their notice. 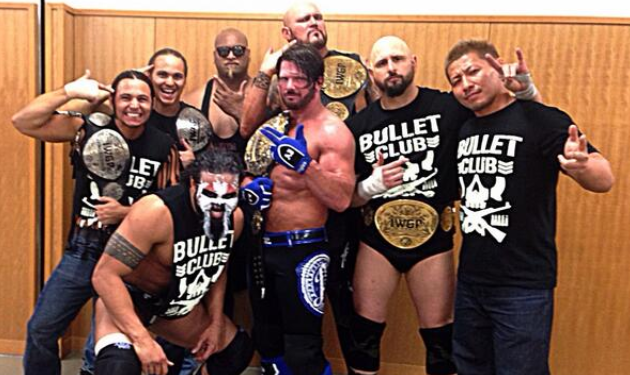 They were Doc Gallows, Karl Anderson, Shinsuke Nakamura and AJ Styles. All four of these men are now part of the WWE system. Doc Gallows and Karl Anderson, formerly a large part of New Japan's popular Bullet Club faction, attacked The Usos on the most recent episode of RAW while Shinsuke Nakamura made his debut at the recent NXT Takeover: Dallas event, puttting on a Match of the Year candidate with Sami Zayn in the process. AJ Styles on the other hand made his debut about 3 months ago when he was the third entrant of the the Royal Rumble.Styles eliminated Curtis Axel and Tyler Breeze and lasted just under 28 minutes before being eliminated by Kevin Owens. Not bad for a debut. Fast forward almost 3 months and AJ Styles is now the Number One Contender for arguably the most prestigious prize in Wrestling, the WWE World Heavyweight Championship. Nobody could've predicted this, not even Styles himself, so where exactly does AJ stand in terms of his position within the WWE right now? Well first lets take a quick look back at Styles' career. Styles has Wrestled all over the globe but he first started in a Georgia based National Championship Wrestling promotion before moving on to WCW of all places. From there he had stints in both NWA Wildside and Ring of Honor. Despite working in these places however, Styles will be known to the majority due to his work with TNA. For almost twelve years AJ was pretty much the heart and soul of TNA and while the brand would flounder, Styles would consistently put on excellent matches with people like Samoa Joe and Christopher Daniels. His list of accomplishments in TNA speak for themselves. He's a two time TNA World Heavyweight Champion, a two time King of the Mountain Champion, a six time TNA X Division Champion and even a two time TNA World Tag Team Champion. On December 16th 2013 Styles would become a free agent and return to the Independent Wrestling scene. Eventually Styles would go on to sign with New Japan Pro Wrestling about 3 months later. When he made his debut in the promotion he laid out Kazuchika Okada and challenged him to a title match for the IWGP Heavyweight Championship which he would go on to win, in his first match with the company. He became the sixth Gaijin (Person of foreign origin) to win the title along with the likes of Brock Lesnar. In a two year stint with both Ring of Honor and New Japan Pro Wrestling, AJ Styles was a two time IWGP Heavyweight Champion as well as the leader of The Bullet Club. He was also recognised by the Wrestling Observer Newsletter for his work in Japan. In 2015 he was given the Lou Thesz/Ric Flair award, which is given to the overall Wrestler of the Year. He was also named Most Outstanding Wrestler for both 2014 and 2015 along with being given the Match of the Year award for his contest with Minoru Suzuki at G1 Climax 24. His finisher, the Styles Clash, was also named Best Wrestling Maneuver for 2015. So those are AJ Styles career achievements. All in all he's had a career that anyone would be proud of. Right now he's arguably one of the best Wrestlers on the planet. Despite this however, none of these accomplishments means that he will succed in WWE. As we all know, the WWE is a completely different Monster compared to every other Wrestling promotion. It's very rare that WWE will give a newcomer the type of push that Styles has received so far in his stint with the company. He started with a program against Chris Jericho where he continually put on entertaining matches with Jericho and even people like The Miz. Styles went on the lose to Jericho at Wrestlemania which was a big surprise to many, but the next night on RAW he won a number one contenders match against Kevin Owens, Cesaro and Chris Jericho. So why are WWE changing things and pushing Styles the way they have? Well the first and most glaring reason is the fact that while Styles is one of the best Wrestlers in the world right now, he's 38 years old and at this time next year he will be pushing 40. It doesn't matter who you are, when you reach that age you start to think about winding down a little. John Cena is 38 which could be part of the reason he's been away from the WWE World Championship picture. In short, if WWE want to capatilise on Styles' popularity, they need to do it now. Speaking of Styles' popularity, this is another reason he's in the position he's in. 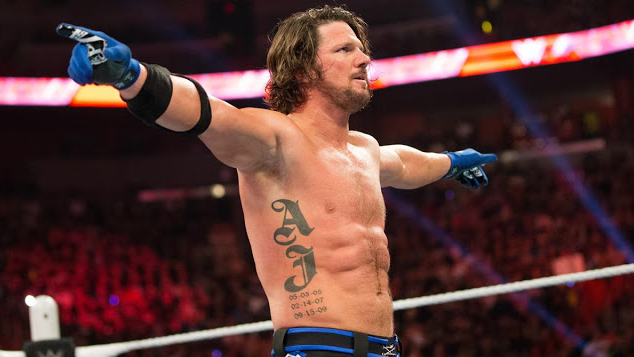 Despite being a relative newcomer to the WWE, AJ Styles is a global name in the Wrestling business. Rumors are that since Styles came into the WWE he has been shifting a lot of merchandise. WWE loves it's marketable talent so the fact that Styles shirts, gloves and hoodies have been flying off the shelves can only help Styles cause. Another large part of the reason AJ is number one contender is something that I've stated already in this article. AJ Style is good. He is really good. WWE is the biggest Wrestling promotion in the world so by default they want to have the biggest and best names in the Wrestling world. As stated, AJ Styles has been a champion everywhere he has plied his trade. Styles is an accomplished in ring performer so putting him up against someone who is under intense scrutiny from the fans like Roman Reigns will only help both men. Styles will come out of his title match still as one of the best Wrestlers while Reigns can justify to some critics why he's where he is. AJ Styles may be good. Even great. But he's not perfect. You'll be hard pressed to find a perfect Wrestler in history. The one thing that could potentially hold AJ back from reaching the top of the mountain is his promo cutting ability. AJ isn't exactly a ball of Charisma like The Rock. He's by no means bad but he evidently lacks that ability to connect with live crowds on the microphone. Lets go back in time a little for a second. As has been stated, AJ has done his best work in New Japan and Ring of Honor. One of the biggest differences between these two promotions and the WWE is that there are far less in-ring promos from the first two promotions. They rely very much on in-ring ability, something AJ has in spades. WWE however, has lots of backstage and in-ring segments as part of their programming. Even in his time with TNA, Styles was never the most comfortable on the microphone, add to that the fact that he has a strong southern accent and there is a chance that this could hold him back. For all of Styles apparent talent, his ability of the stick is by far his main flaw, but as we've seen, this doesn't necessarily hold you back. Roman Reigns isn't much better at cutting a promo than Styles is and right now he happens to be the man standing in between AJ and the WWE World Heavyweight Championship. When it all comes down to it however, Styles is an incredible in ring performer and his ability in between the ropes will more than likely be able to mask his weakness on the stick. So does Styles have what it takes to succeed in WWE and maintain his position in the main event slot? Well before you answer this you have to factor in the Injuries WWE has right now. Seth Rollins, John Cena and Randy Orton are all still out with Injuries. When these three return, they all have legitimate claims to be near the WWE World Heavyweight Championship. Combine these three with the likes of Cesaro, Kevin Owens and others chipping away at that Glass Ceiling and you have to believe that it will be difficult for AJ Styles to keep his position at the top of the card. He will no doubt put on a solid matchup with Roman Reigns at WWE Payback but if that match becomes a classic then the higher ups backstage in WWE may have no choice but to keep Styles near the main event unless they want another incident similair to Daniel Bryan. 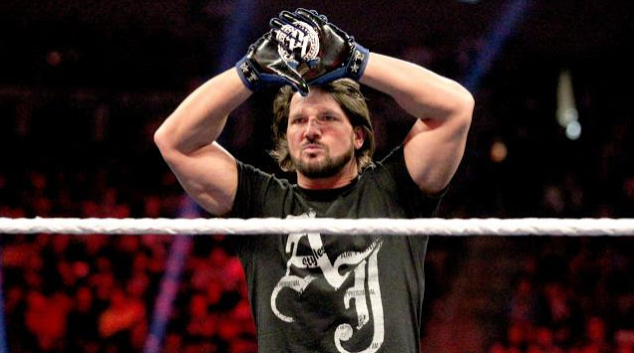 Now that AJ Styles is number one contender, can he stay there and continue to be one of the top names for WWE?